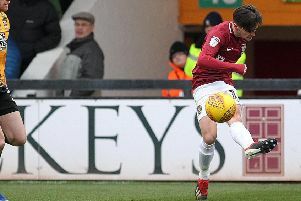 Walsall manager John Whitney had no complaints over Amadou Bakayoko’s late sending off as he bemoaned his side’s ‘really poor discipline’ during their 2-1 defeat to the Cobblers at Sixfields on Saturday. A bad-tempered affair always seemed on the verge of spilling over and that’s exactly what happened in stoppage-time when Bakayoko went flying in on Sam Foley, prompting a furious reaction from several Northampton players. It wasn’t through lack of effort but the decision-making let us down. John-Joe O’Toole was excellent for them and he bossed it, I thought he showed his experience. Bakayoko was rightly given his marching orders by referee Charles Breakspear and Cobblers midfielder Matt Crooks, already on a booking, followed suit for his part in the aftermath as Town held on for victory. “There’s no arguments with Amadou’s red card,” admitted Whitney afterwards. “Our discipline today was really poor. There were too many free-kicks, too many silly, stupid fouls and it stops momentum and just played into their hands. Earlier in the game, Erhun Oztumer pounced on miscommunication in Town’s defence to steer Walsall into a second-minute lead but Chris Long promptly levelled with his head and then completed the turnaround with a fine low finish, ending Town’s six-game winless streak. “I thought we started really well,” added Whitney, whose side went into Saturday on a three-match winning run. “I knew they’d be on the front foot and we’d have to play over the press which we did really well and got the goal out of it. “But they’re not going to sit back after going 1-0 down and we had to play beyond the energy and not give them a chance. “As a group, we’ve got to be resolute and make sure we don’t concede in that 10-minute period because that quietens them but instead they got the momentum and in a way the fact we got the first goal backfired as they got the goal back and kicked on. “We’ve got to manage the game better and as a group they have to have a good think about that. “It was always going to be a real tight game, a scrappy game, and we knew that Jimmy would get in our faces and stop us playing. They stopped us getting any fluidity to our play. “We had to scrap when we needed to and recognise when it was on to play. It was a tight game but we’re stood here with a defeat.